Exercise #152 : "Out in Front"
On a typical morning in June, if you were to stand out in front of your residence, your back to its entrance, what would you see? What would be there that is always there? What would be moving? What might surprise you? Be as specific as possible, using colors, shapes, smells, sounds, etc. This exercise moves us into month 6 of my list, and that means that I'm nearly halfway done. Woo!! It's summer, and that means the canna lilies are blooming right by my front porch. 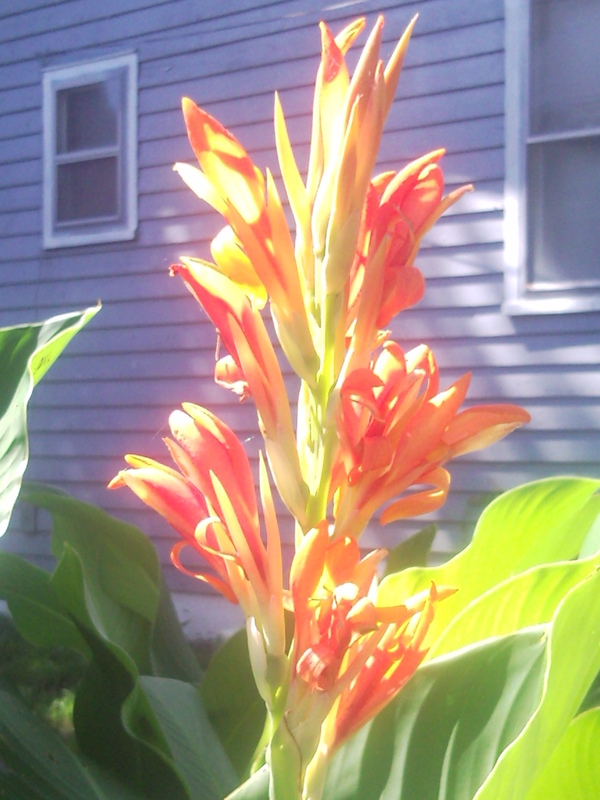 I always love this time of year, because my "little" cannas reach for the sky, and unfold their beautifully colored petals to the world. 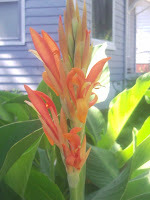 Sadly, the blooms are short-lived, but it gives me something to look forward to all year round. Additionally, it's odd to stand next to a flower that's nearly as tall as you. Flowers are supposed to be dainty... right? Other than my gorgeous flowers, my front porch is unremarkable. My new roommates (both incidentally named Charlie) have a small grill set up on the corner. This summer should be filled with lots of grill parties and fun times. Looking further out, I see trees. Lots and lots of trees. My whole street is peppered with them, which seems slightly ironic because three fell during the flood a few weeks ago. Three fell, and there are still more to be seen. And they're not little trees either. These are those giant, thick-trunked trees that make you feel like a tiny little ant scurrying home along the pre-established line of scent, praying that nothing interrupts the trail. If I didn't know any better, you'd think we were in a really poor section of suburbia. That's one thing I love about Nashville. There's foliage everywhere. Even downtown, trees pop up between buildings and streets. It's nothing like New York, where trees and other greenery are strictly monitored, and I think that's part of the reason why I got burned out when I lived there. I frequently visited Central Park on my own just to get my daily dose of nature, but the second you step outside the Central Park walls, you're thrust back into the unforgiving world of asphalt and metal. I need something below my feet that has a little give to it, a little bounce. I'm not saying I'll never go back to New York, but, as things are right now, I much prefer the Music City's scenery to that of The Big Apple's. What do you see outside of your home? Do you prefer smaller cities and towns to big cities? Or are you destined for the big city life?